Turning Your Dream Into Reality | Dream. Delight. Inspire. I was thrilled by the interest in the first post in this series – thank you to everyone who posted it on Facebook, retweeted the link and sent me messages and questions. What is it about your current role that pushes you towards self-employment? What would be the main reason for your transition? What areas do you have valuable knowledge in (be specific)? What are your marketable skills? If ‘more money’ was included in your answers for numbers 1 and 2. Do not quit your day job. Being self-employed does not mean that you will magically earn more. In fact, you’ll probably earn less (at least in the first few years). What you can do if money is a driving force, is supplement your day job income with creative income. Or go part-time in your current role and utilise your newly free time to work on creative projects. Take a long hard look at what you have written for numbers 3 and 4. Write them out side by side as a list and link knowledge based answers with skill based answers. Not all of them will partner up with something else and some of them will be able to be connected with multiple skills. Now comes the slightly trickier part. How to create income streams out of your knowledge and skills. Put the groups you have created on separate sheets on paper. Start writing possible products and/or services that you could offer if you combined these sets of knowledge and skills. Underneath each product and service write what you would need in order to be able to produce or offer it (equipment, extra training, office space etc). Hopefully it is a pleasant surprise to see all the possibilities that come out of what you already know and how easy it would be to start the wheels in motion on some of the projects. For the example above, I would suggest that the person has a lot that they could started on right now. Start to do some logo designs for friends/acquaintances for free to grow a portfolio and get feedback on designs. Then you can start a website aimed at small businesses that require low cost, professional looking logos. You could also write a blog post/eBook on how to teach yourself Photoshop. Research top graphic design/photography blogs/websites to see if they’ll host it as a guest post which would generate traffic through a link to your logo design website. It’s all about free promotion and visibility people! Start to create a theatre/film makeup portfolio. There are a lot of models and photographers needing to build theirs, so aim to find people who are willing to trade their time for shots of the completed work. You could upload tutorial videos on YouTube, linking to a blog on theatre makeup techniques or a website offering your services. Eventually, down the track, you could create a workshop targeting makeup artists that would like to get into this specialised field. In terms of your knowledge of art history, you could start small tours of your city, focusing on the outdoor art and the background behind the pieces and the artists. Tutoring kids or adults in Spanish one on one is a no-brainer. Of course throwing amazing dress up parties is valuable knowledge. Create a website for boutique event planning, specifically themed parties. Make sure you keep them small initially and only take on one or two projects at a time. You could start by writing guest posts for lifestyle bloggers in your city/country on specific themes or ‘things that commonly go wrong and how to avoid them’, linking to your website and therefore your services. What projects could you get started on right now? What have you got to lose by setting these up? I have been asked “how I did it” numerous times. People send me messages about how brave or inspiring I am – inspiring maybe (thank you) but brave, no so much. My decision to work for myself wasn’t born from bravery but rather from fear. Fear of what my life would look like if I worked 9 hours a day (and commuted for 2), at a desk, in a job I didn’t love. I was afraid of what I would become after years and years of this. So I had to try something different. Sure, I could try a new role in a new organisation and see how that felt, but somehow I knew that wouldn’t be a good fit for me either. It was the long hours, the restricted work environment and the lack of flexibility that made me cower every Monday morning. I am in the middle of writing an e-book about making the transition from employee to self-employed and will hopefully release it here on Dream. Delight. Inspire. in the next few weeks. I’m pretty excited about it – it’s taken a lot of hours and coffees already, let me tell you. What is it about your current role that pushes you towards self-employment? Long hours, poor management, lack of flexibility for holidays, feeling under-utilised…? What would be the main reason for your transition? More money, flexible working hours, working from home, creative control…? What areas do you have valuable knowledge in (be specific)? Song writing for flute, knitting baby garments, teaching tap dancing, organising large scale volunteering projects, creating floral arrangements for weddings…? What are your marketable skills? 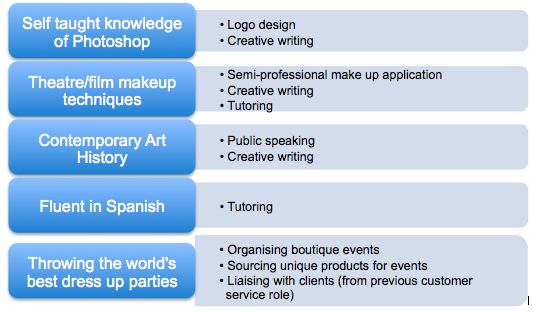 Report writing, illustration, sound engineering, building client relationships, sewing, computer programming…? Write down as many ideas as you can for numbers 3 and 4. You may be surprised at how many subjects you know a lot about and how many marketable skills you have under your belt already. Discovering what your dream really looks like is the first step in the planning process. People may say “I love to draw so I want to be a full time artist” – okay but in reality, a full time artist may not earn enough to support your current lifestyle. If you want to work for more creative control and money isn’t a factor, then this may be possible. Perhaps you move back home or flat with 3 others in a cheaper area. OR you plant enough seeds in different areas that you have several potential income streams. One might be selling your paintings on Etsy, one might be creating art for cards and selling these in small local bookstores, one might be teaching art history or giving guided tours of the outdoor public art in your city. I’d love to hear your answers to the questions above – post them in the comments if you’re willing to share. You may also have some questions that you’d like answered around this topic, please feel free to comment or email me (kimberleyms@gmail.com).